Lion's Head Soup Bowl from Stonewall Kitchen for $7.95. Mini Lion's Head Bowl Set of 4 from Stonewall Kitchen for $15.95. You will look like the ultimate host/hostess serving your guests soup in these bowls. And the mini bowls are great for serving jams in - I've been looking for little bowls just for that purpose and these are exactly what I had in mind. 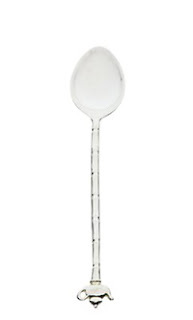 Teatime Spoons from Anthropologie for $28.00. I am kicking myself for not picking these up the last time I was in Anthropologie. I suggest you don't make the same mistake since these are just right for stirring coffee or tea. Sycamore Salt Cellar from Anthropologie for $28.00. The Monarch's Salt Cellar from Anthropologie for $28.00. The leaf motif is great for Fall/Winter while the crown motif is right on point with today's trend. Nigella Lawson's Living Kitchen, Mezzaluna/Herb Chopper from Bliss Home for $18.70. Nigella Lawson's Living Kitchen, Utensils Set from Bliss Home for $55.22. What a fresh alternative to the usual stainless steel utensil sets you normally find. Vintage Magnetic Kitchen Timer from Wrapables.com for $11.95. Add an unexpected pop of color to your kitchen with these timers. Woven Washable Baskets, Set of 2 from Wrapables.com for $49.00-$59.00. Baskets are great for storage in the pantry. I use mine for kitchen linens and seasonal items. For less expensive baskets, I would suggest going to your local Marshall's, TJ Maxx, Michael's, or HomeGoods for alternatives. Cobalt Mixing Bowls Set of 4 from Stonewall Kitchen for $179.00. I told you I was obsessed with blue and white anything. Le Creuset Oval Dutch Oven, 9 1/2-Qt. from Williams Sonoma for $325.00. My favorite Food Network chef, Ina Garten, uses this when she makes soups and stews. It's great because it's large enough to hold all of the ingredients, heats things evenly, and it's oven-safe.